For the first test and tune session, I ran some baseline laps for a balance check and then settled on a slightly higher rear spring rate to help the car rotate. The Nationals TNT course is not always a good indicator of balance/pace on the race day courses, but it is the only option for last-minute tuning. My Dad ran two sessions in the car to get more seat time. He has made some big strides throughout the year as it is hard to get comfortable with a race-tire-shod 350HP RWD racecar when your normal autocross car is an STX class Mini Cooper and you only drive the Camaro a few times per season. ESP ran in Heat 3 of the Tuesday/Wednesday group and we started on the West Course. The West Course was fairly straightforward meaning there was not an excess of cones and purposeful "tricky" visual elements that are typical of National courses. Heat 3 started in the heat of the day with ambient temperatures around 95 degrees. There was two heats worth of rubber laid down on the track which should have made for decent conditions. To my surprise (and many of my competitors), it was hard to make the front tires work in these conditions and I struggled with understeer on each of my 3 runs. My first run clocked in at a 59.289 which was good enough for P3 in class - 0.1s behind 2nd and 0.6s behind Mark Madarash in 1st place. Mark laid down a quick first run (58.8s), but was then one of only a few drivers to pick up time on his 2nd and 3rd runs. He finished with a class-leading time of 58.691s. One of the keys to his was his mid-session ARB adjustment - an option I did not have with my non-adjustable front and rear ARBs fitted to the Camaro. This is something to improve on next year - quick, in-session balance adjustments. Tire blankets on trying to keep the Goodyears hot! Going into Day 2, my goal was to at least match Mark's time and to move into 2nd place. I knew Mark would be hard to catch for the win, but I never gave up hope there either. The Day course was about 10s longer than Day 1 and had more technical elements that tested your vision and "course-reading" ability. To improve the understeer issues from Day 1, I removed the spoiler and increased the rear spring rate. The understeer from Day 1 was especially bad in high-speed corners and it felt like the rears were over-driving the fronts. The change worked and it was easier to make the car rotate, but unfortunately, 2nd place was not to be had. After two runs, I had moved into P2 over Britt Dollmeyer in his 2006 Ford Mustang GT by two tenths. On his third run, he threw down a very quick 68.641 which moved him back into 2nd place by over a half second. I needed 6 tenths on my last run, but was only able to come up with a 4 tenth improvement (68.711s). I finished 3rd in class and cleared 4th place by 0.5s. In the end, I was happy to keep the final step on the podium! I have lots of room for improvement on the Camaro and we will be back next year to contend for the ESP National Championship. Congrats to Mark Madarash on extending his winning streak and taking home the 2012 ESP title. My Dad and faithful co-driver had a great time at his 2nd trip to the Solo Nationals. The 33-car ESP field was very tough and he finished in the 28th position. He had a great Day 1 and was closer to myself and Mark than he had been all year. This put him somewhere around 20th, but he struggled a little bit on the Day 2 course and dropped down to 28th. He is always getting faster and continues to be a great student! I just hope he enjoys racing with me as much as I do with him! I have many people to thank, but let me start with a big congrats to Lane Borg for winning his first National Championship this year in his bright yellow C5 A-Stock Corvette. This was also the first National Championship for the Goodyear Eagle RS brand! He came back on his last run on Day 2 to win by less than a tenth over Tony Savini who also drove great all week. Watching those two battle was a lot of fun. I also have to congratulate one of my autocross mentors and now sponsors - Sam Strano - on winning the prestigious Driver of Eminence award. Congrats Sammy! 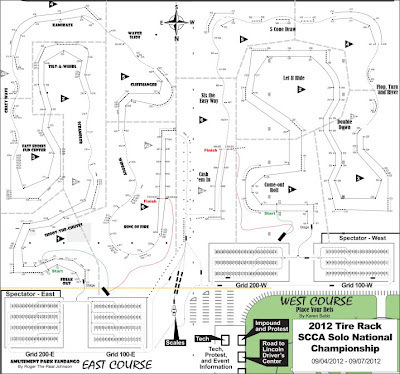 The 2012 SCCA Solo Nationals are here. My parents, Ali and I arrived in Lincoln, NE yesterday to setup our pits and get ready for the event. Today, my Dad and I each ran one test n' tune session each to get re-acquaint ourselves with the Lincoln surface and to tune the balance. I started off with adjusting rear spring rate and went to a stiffer rear spring to make the car rotate better mid-corner. I'm happy with the minor change and will be running this setup for the Solo Nats. My Dad is running one more test session tomorrow to get more seat time in the car before race day. We are #99 (My Dad) and #199 (Me) in E Street Prepared class which runs on Tuesday (West Course) and Wednesday (East Course). We race during the 3rd heat which should start sometime between 11:30 AM and 1:30 PM on both Tuesday and Wednesday. 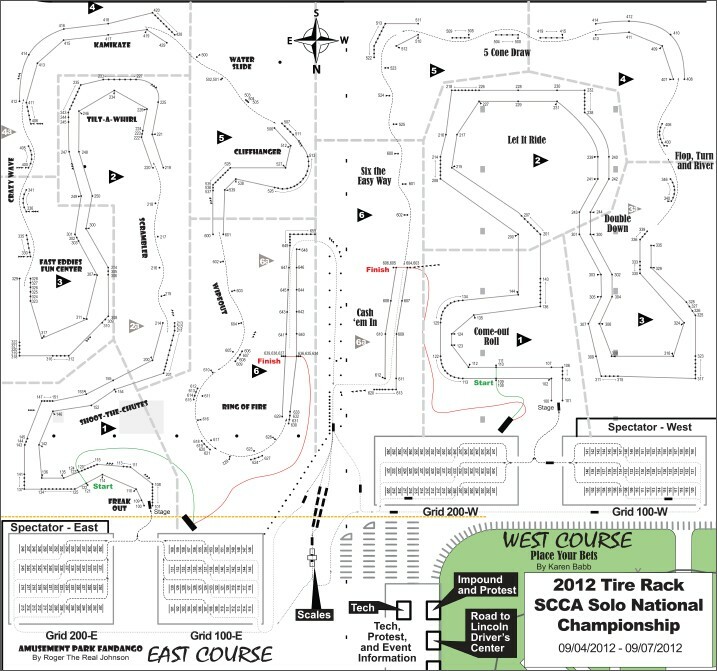 The Solo Nationals is scored by combining your fastest time from each day (two different courses) - fastest overall driver wins and is crowned an SCCA National Champion! See the links below for a schedule, live timing, and live video from the event. Follow along and root for the #99/199 Goodyear Eagle RS/StranoParts.com Camaro Z28 to take the National Championship in ESP!